A live broadcast from WBAI's Free Music Store on December 4, 1971 organized by tuba player Howard Johnson (1941-). Toby Hanks performs 5 studies for tuba alone by David Reck. Guitarist John Murtaugh joins Hanks for performances of English Renaissance music, Love's god is a boy by Robert Jones and two songs by John Dowland, I saw my lady weepe and Come again; Stephen Johns, Richard Schneider and Tony Price, all on tuba, join Hanks for a performance of What if I never speed? by Dowland, O quantus luctus hominum by Giovanni Pierluigi da Palestrina, and La bourrée by Michael Praetorius. WBAI's Barbara Oka describes the scene inside the studio to the home-listening audience. Hanks, Howard T. Howard, French horn, and Zita Carno, piano, perform Suite no. 1 for horn, tuba and piano. Howard Johnson introduces Substructure, comprising himself, tuba, Morris Edwards, tuba, Bob Stewart, tuba, Jackie Jeffers, tuba, Joe Daley, tuba, Earl McIntyre, tuba, Herb Bushler, bass, Kenny Pine, guitar, and Buddy Williams, drums. 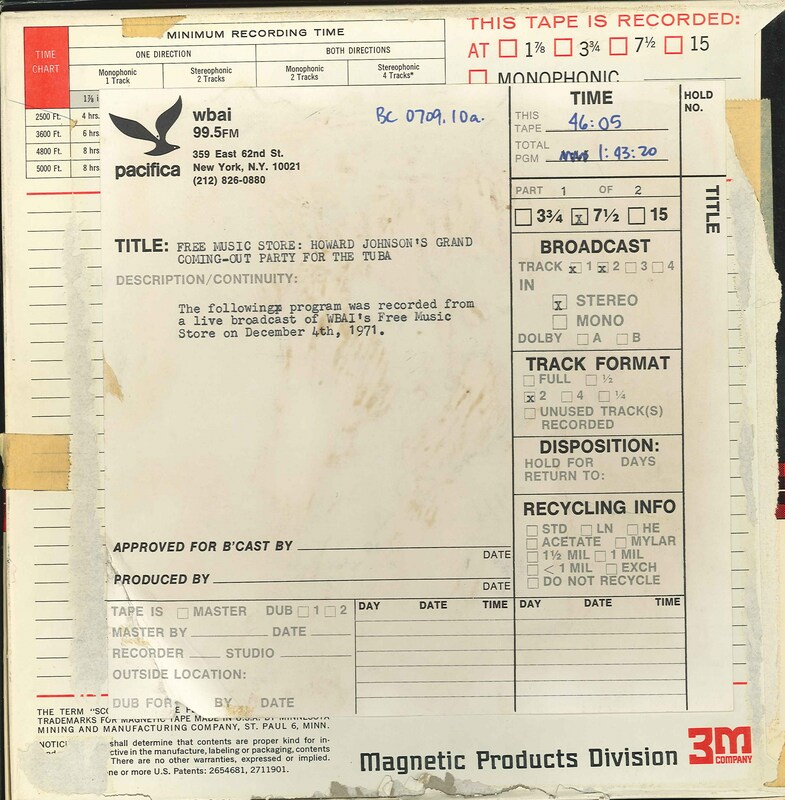 This recording was formerly cataloged as BC0709.10A.